I decided to hold off on the review of the Bushido until I had at least 50 miles on them and had the opportunity to test them on both technical dry terrain as well as a more slick/muddy terrain. As is always the case, all feet are a little different so I tried to provide as much detail as I could to help you decide if the Bushido may be worth a try. This description is fairly accurate from my experience. It appears to me that the development process of the Bushido paid extra close attention to keeping you comfortable and on your feet in the most technical conditions. Size: Runs small. I went from a 43 up to a 43.5. The upper is designed to hug the foot and keep it in place. I found the fit to be snug, but comfortable at the same time. The shoe does a great job at wrapping around the midfoot in particular, holding it securely in place. The heel is rather is narrow, which is a staple of La Sportiva shoes. It will fit best if your foot is on the narrow side; I experienced no heel slippage in the Bushido. If you don’t have a particularly narrow heel, I could see some potential blister issues on the side of your heels in this shoe. The rather thin tongue of the shoe enables the rest of the upper to sit close against the foot and helps to eliminate gaps between the shoe and foot that rocks and dirt often creep down into. I don’t use gaiters and in my runs so far, I have not yet had to stop and pull anything out of my shoe. No matter what complaint you may have about the Bushido, you definitely won’t be able to criticize its grip. This shoe clings to the trail better than any shoe I have ever run in. I have had a chance to take it over rocky terrain, across loose sand, and through thick, sticky mud and in all of those scenarios, I never questioned my footing. These handled it all remarkably well. The outsole is grippy, aggressive, and durable. I can honestly say that I won’t even consider another shoe at this point if I know I am running in any of these conditions. Grip. The Bushido is second to none. The trails in the Wasatch Mountains here in Salt Lake City are extremely rocky and technical. These shoes handled them perfectly. Fit. If your foot is on the narrower side and you get the correct size, you will certainly love this shoe. It wraps the foot so nicely that you will hardly even notice it. Stable. Fingers crossed, but no rolled ankles or even close calls to this point. It handles uneven terrain, rocks, and roots very well. The heel cup on the insert rises a bit too much on the sides, which I guess is meant to help hold the heel in place, This is a bit unnecessary in my opinion because the shoe itself does a good enough job at that. For me, it was causing some rubbing on the sides of my heel which would likely cause blisters over longer distances. If I could change it, I would flatten it out a bit. As an alternative, I actually swapped the inserts out with the ones from my La Sportiva Ultra Raptors and the issue was resolved. Trail runners are often resourceful and could probably come up with some other solutions as well. They run small so be aware of the sizing. As La Sportiva’s generally run narrow, if you go too small you may have some uncomfortable rubbing on the big toes. When I sized up by a half size, I had no issues. This is a true trail shoe! They feel great on the trails, but if you like your legs, do not take them on pavement. This isn’t a multi-purpose shoe. The Bushido has a very specific purpose (technical terrain) and is EXCELLENT at that! 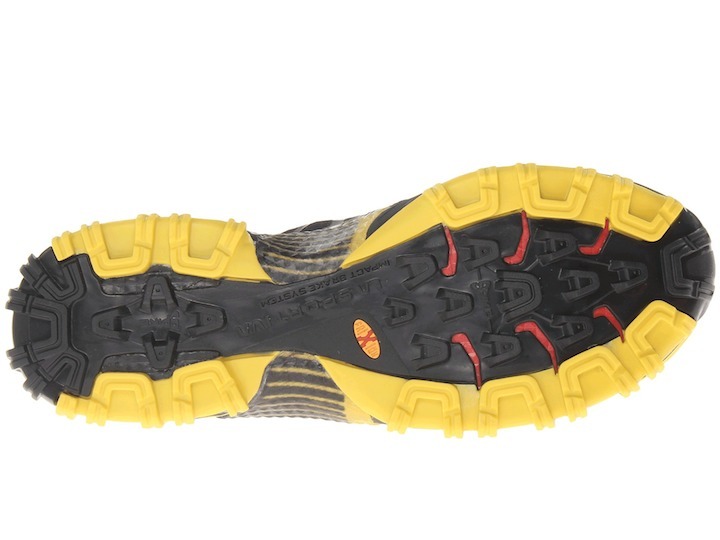 While I don’t see myself using it on a flatter, drier course, it is so good at handling technical terrain and sloppy trail conditions that the Bushido is my new go-to shoe in these instances. As I previously mentioned, I will likely limit these to distances of 50K or below. Overall, it is a nice addition to my running shoe toolkit. 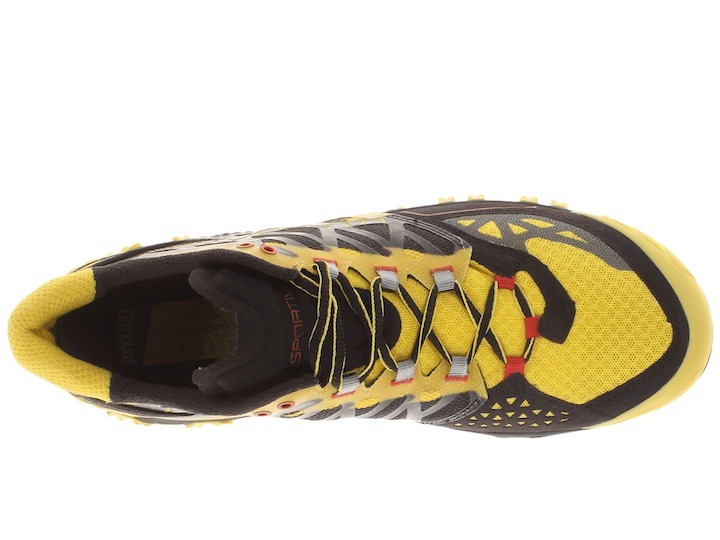 This entry was posted in Gear Reviews and tagged Bushido, La Sportiva, shoes, trail running by Ultrarunner Joe. Bookmark the permalink. Great review! I saw the link on the Trail and Ultra running FB page. These shoes look good! i have the Vertical K and while I love the lightness and grippiness, man if there isn’t at least one time during every run where it feels like a rock just speared right on through the rock plage, leaving me with soreness or foot bruise that lasts a good week or so! Thanks for reading! In regards to your comment about the Vertical K, it actually doesn’t have a rock plate…I have similar issues if I don’t watch where I step. The Bushido would certainly be an alternative that would solve that problem. Also, if you really like the Vertical K, you might want to try the Helios. The Helios basically has the same outsole as the Vertical K. It is not as grippy as the Bushido, but I think it is a bit lighter and more responsive. Thanks for the review. Very good! Just want to check sizing vs. the Helios or other La Sportiva shoes before I buy online. I’m a EUR 46 in the Helios, did you size the same in the Bushido? I’m generally a US12 in most other shoes so I sized up a 1/2 size. Nick, thanks for your comment. I actually sized up a half Euro size. I wear a 43 in the Helios. I tried a 43 in the Bushido and they were too snug. Went up to a 43.5 and they were perfect. Hope this helps! Probably a bit late but your ultra raptors vs the bushido in size. Where they the same or did you go for a bigger bushido? I have a pair of bushidos and I want a pair of raptors for ultra distances but not sure about sizing and I don’t have any where to try them on? I went a half size bigger in the Bushido and they are still a bit tighter. The Raptors are a bit more true to size in my opinion. I wear a 10 in those and could have probably gone an 11 in the Bushido. Hope this helps! Thanks. I am worried about the bushidos on an ultra. I would mostly use them for adventure racing and cant afford battered feet. With a full pack and long hours the hard soles are likely to do that. I have them in a 46 and they are a good size. Will try for a 45 in the raptors and see then.